Here are the key numbers on your electricity bill and what they mean. Use this tool to calculate an estimate your electricity usage over a 30-day period. Please note this bill calculator is for guideline purposes only, and your actual bill amount may vary from that stated by this calculator. 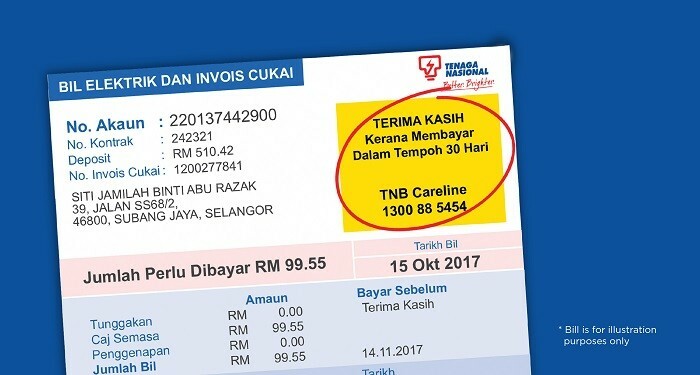 Service Tax (ST) at the rate of 6% will be charged in TNB electricity bills for Residential Customer with consumption more than 600 kWh @ RM 231.80 effective from 1 September 2018. The 28 day billing rule is applicable where the entire consumption will be charged Service Tax if the billing period is less than 28 days. *maximum demand, peak and off-peak energy charges. **Service Tax for the month of Aug/Sept 2018 will be prorated. Stay informed about the penalties and fees that may be imposed on you, why it is imposed, and how to avoid them. Find out more on events leading to connection/disconnection of your electricity supply.